The Rancho Palos Verdes destination opens a greenhouse dedicated to salt collected near the property. Adore sea salt in all of its flavorful forms? Terranea Resort has a new sea salt conservatory which will "harvest and produce" the property's signature sprinkle-on. ADJACENT OCEAN: When you sit down to a meal in a nice restaurant at a fine hotel, and you learn what you're about to consume came from not too far off, but rather locally, very locally, as in down the bluffs and across the beach and from beneath the waves outside the restaurant window, you would probably guess that a fish of some sort is in order. But other things hail from the Pacific, like sea salt, and when that fine restaurant is just a short stroll away from that ocean, and the chef is a champion of farm-to-plate policies, well... That dish of sparkly glisteny bits sitting before you could have also hailed from the waters nearby. 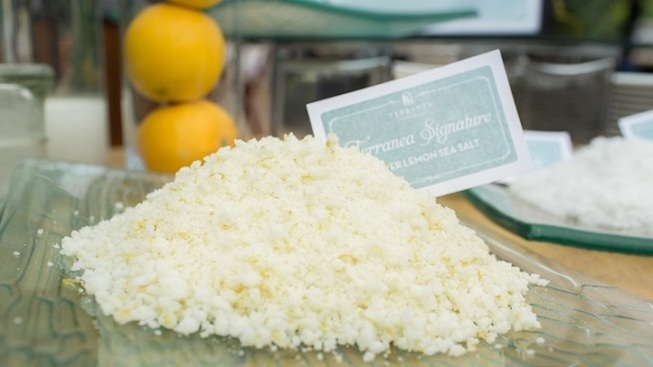 That's the culinary-flavored case at Terranea Resort, which not only offers a signature sea salt throughout the eight restaurants dotting the property but very often a flavorful array of salts that put a spin on the original (think Meyer lemon and rosemary and other fragrant herbs). And, yes, the salt guests enjoy started fairly close by, beneath the foamy breakers just beyond the property's watery edge. But where is it housed to evaporate, naturally, with the help of the sun, before it takes on an additional flavors (if it will) and before it heads to the tables of Terranea? A SEA SALT CONSERVATORY... is the answer. The Rancho Palos Verdes property just built and debuted a snug greenhouse made just for the sea salt collected for the octet of eateries, and, yes, "greenhouse" is the word, given the fact that the salt within will rely on beams and rays from our nearest star to obtain maximum readiness. The Terranea Sea Salt Conservatory had its grand ribbon-cutting on Earth Day, which means that the resort can now become "sea-salt-sustainable." Chef Bernard Ibarra is putting the focus on Farm-to-Terranea initiatives, so count the conservatory in as one of the most visual. We can only suspect that visiting foodies who have a sweet spot for sea salt might long for one of their very own. And greenhouses, of course, don't always have to hold plants. They can hold the savory, grain-small stuff we sprinkle on our edible plants, like kales, broccolini, salads... Yum. So next time you gaze out from Terranea, and wave at Catalina Island, ponder the sea salt originating in the waves below. If you've enjoyed sea salt in the past, have you ever considered what water it hailed from? Now you'll be quite near the source.